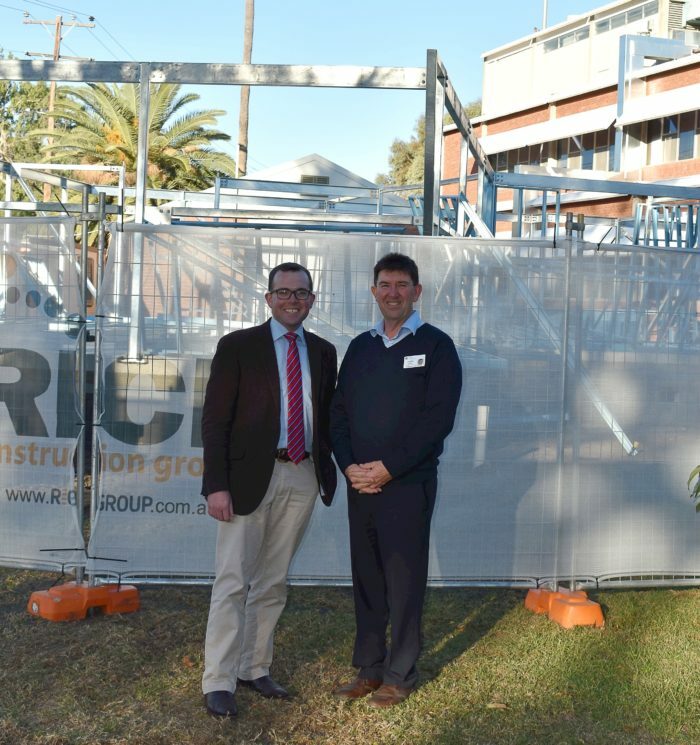 Northern Tablelands MP Adam Marshall, left, and Hunter New England Health Mehi Sector General Manager David Quirk outside the new renal unit construction site. MEMBER for Northern Tablelands Adam Marshall has inspected construction progress on the new, purpose-built, $2 million Renal Dialysis Unit at Moree District Hospital this week. The new eight-chair unit is being built adjacent to the existing hospital and will herald a new era in renal treatment in Moree, according to Mr Marshall, with a more spacious and comfortable are for patients and hospital staff. “This new unit is being built with the future health care needs of the Moree district in mind, equipped with three extra chairs compared with the existing facility, which was completely funded by the local community,” he said. Since turning the first sod of soil on the project with Mayor Katrina Humphries in April, Mr Marshall said construction was progressing well and the new unit was on track to be open and treating its first patients before Christmas this year. “The hospital staff, current patients and the community has been watching the construction with great interest and excitement,” Mr Marshall said. Mr Marshall said local patients with end-stage chronic kidney disease were not able to access their treatment at home and Moree Hospital was often at capacity in trying to accommodate demand for dialysis. “I’ve spoken with a number of locals who have had to endure the six-hour round trip to Tamworth three times each week for dialysis treatment,” Mr Marshall said. “This situation is out of reach for many and debilitating for those who can and now there is hope with this new unit being built. “Hospital staff and the local support volunteers need to give themselves a well-deserved pat on the back for helping secure this new facility, as well as providing care to patients even when resources were stretched. Mr Marshall said the new facility has been designed to modern standards and will be spacious with a pleasant outlook. The additional room means renal patients are able to more easily have visitors with dialysis often taking many hours. The new eight-chair facility will replace the old five-chair facility and is being built by regional company Rice Construction.